At the start of the year, I shared with you my goals for the year. I then done a little catch up about them in May, and had actually done some, or was near finishing a few of the others. Well, it's now the end of the year, so about time I done a final review and check in of them! I managed to lose almost a stone and then put some of that back on! Sadly didn't do to great with this one, but I have lost some weight since the start of the year, so I'm calling this done! I figured out how to take and edit pictures a lot better, so totally achicved this one IMO! This had been done in July/August, but it's since got so messy and unorganised again, so fail here! This has gone well in my opinion. I've cooked a lot more and not relied on my Dad to make sure my car is alright and that things get fixed indoors. I have my own toolbox, so I've been having way to much fun! I've also done a load of banking, car, work and life 'things' all by myself without help! 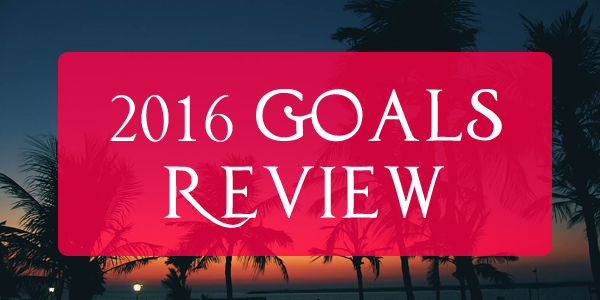 I don't think I've done too bad with my resolutions or goals for the year - even if I did struggle with some of them! I'm calling it a win for the year! 750 Bloglovin followers 👍 Managed this back in March! 450 Instagram followers 👍 Managed this on Feb 1st! Currenly over 1000! 250 YouTube subscribers 👍 Mid March I hit this, so super happy with this! Now over 330! 150 Facebook page likes 👍 Hit this about a week in February! 150,000 blog page views -- Not hit this yet, but I'm on 139k right now, so don't think I'll hit it before the end of the year sadly! Can't say I've done bad though - I started the year on 82.004 views, so to end on about 140k is amazing! You've done so well Tania!! It's ok if you went back on some of the goals- it happens to us all. Any goals for 2017?